NASA’s had Mars on the brain for many, many years, way before it was drawing massive male members in the martian sand. Ever since it sent astronauts to the Moon, NASA’s had its sights aimed at the Red Planet. 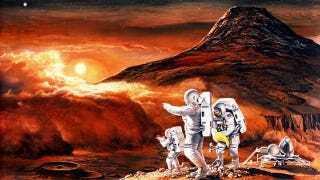 These amazing retro images dug up from the archives show just how NASA thought Mars would be.